Covergirl Nail Polish in "Diva After Dark" || Maybelline Vivid Lipstick in "Fuchsia Flash"
Dressing for fall is just the best. Give me a great pair of jeans, a cute pair of boots and a cozy sweater any day of the week. But the cherry on top? 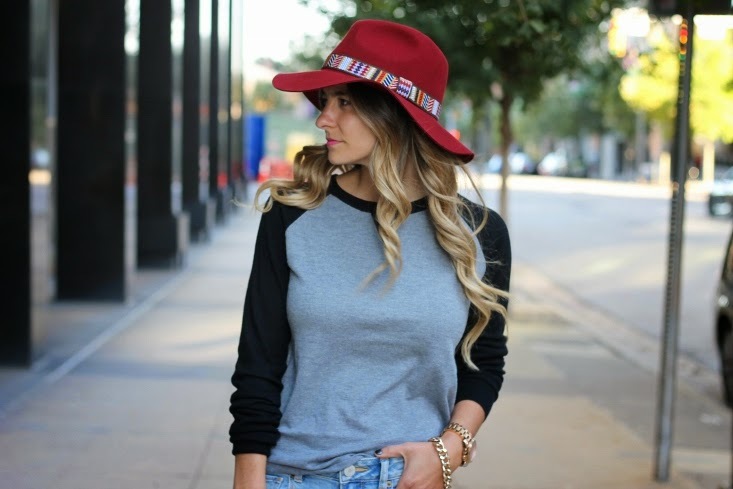 A fabulous fall hat to go with all that! This wine colored Sole Society fedora was just what my fall wardrobe was crying out for. It's rich in color and gives any look that special pop of punch. I love that I'll be able to dress it up with a fun dress and tights, or wear it casual like this outfit. shop more Sole Society hats below! That is a great pair of jeans. Love the hat on you. I keep wanting to jump on board with that trend but I can't figure out when to wear the hat?? Oh girl - you'd look great in a hat! Any of your past outfits really - but you can never go wrong with leggings and boots or jeans and tee! Love the destructed jeans and that hat is superb. I have some clothe hats, 20s style I will get out soon,but love the color and style of yours and those cute booties. Those ripped BF Jeans are wonderful and I want a pair. I need to find my Wine Floppy Hat (made of Felt) that I purchased at the end of Winter last year. Yours is lovely. 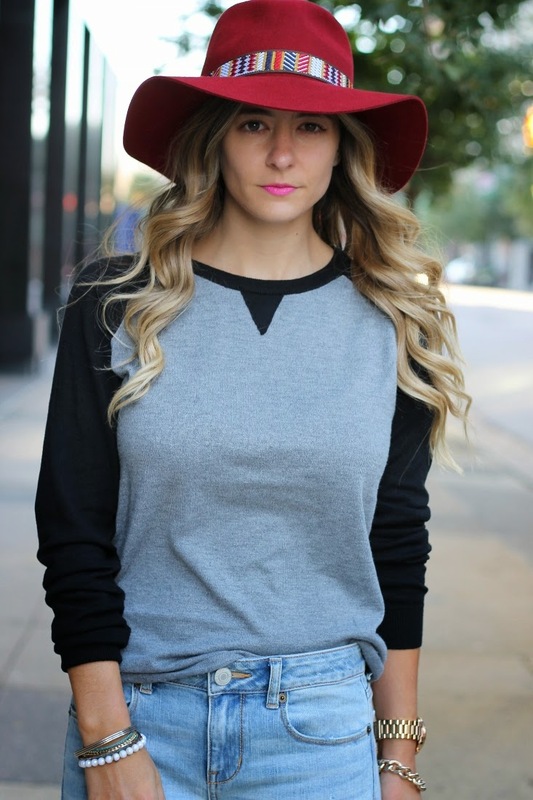 Such a chic, sporty, edgy and trendy daytime look for errands. You look great. Now THAT is one heck of a hat. I immediately fell in love with the first scroll! The detailing of that band is awesome- good choice for fall indeed!